University graduations are slightly silly, but worthwhile events. However, international distance education students tend to miss out on all the pomp and circumstance. Perhaps embassies could put on a ceremony for graduates of that country's institutions. 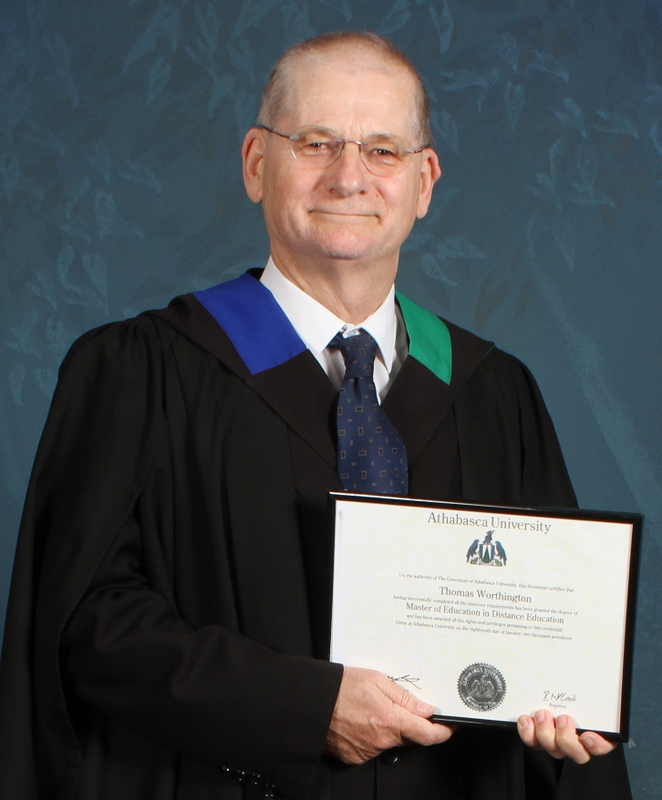 Here I am in full academic regalia for my Master of Education in Distance Education, awarded by Athabasca University (Canada), 18 January 2017. I was not able to attend the ceremony in Canada, but wore my new master's hood on stage as a member of faculty at the Australian National University graduation last Wednesday in Canberra (last time on this stage was to receive an ANU qualification). You can see me in the procession onto the stage, 2 min 50 seconds into the video of the ANU ceremony. Athabasca doesn't have headgear for Masters, so I was the only one on stage without a hat. The photographer asked if I had the hood on the right way up, but I didn't know (nor did anyone else), as they had never see one from Athabasca in Canberra before.